Did you know IAM publications going back over 128 years are available online? 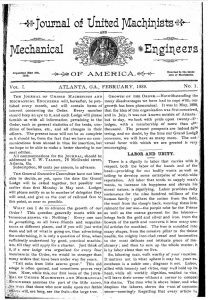 Through a partnership between the IAM and Georgia State University Library you can search over 2,500 IAM local and district periodicals dating back to the beginning of our union. In addition to publications, you’ll also find history of the IAM, manuscripts and oral histories. This is a great resource for anyone looking to research and learn more about IAM history. If you are interested in IAM history, you may want to consider attending the Lodge History Project Program held at the William W. Winpisinger Education and Technology Center June 11-16, 2017. Mark the date on your calendar and look for an announcement on class registration in the future. Search the entire IAM archives here.